The LeCroy WaveRunner Xi is the most powerful and capable scope available in its class. Basic system validation using advanced triggers, fast viewing modes, measurement parameters, or serial decodes is simple and easy. Advanced debug, multi-domain analysis, and waveshape analysis are possible with tools unique to WaveRunner Xi. Optional application packages help you make sense of well-defined problems. With 5 GS/s and 10 Mpts standard on every channel (up to 10 GS/s interleaved with 64Xi, 104Xi, and 204Xi), you can be assured of precise measurements of fast signals, and long captures of slow-speed events. A big display is crucial to understanding circuit behaviors, especially when working with a combination of analog, digital, and serial data signals. That is why we use a big, bright 10.4" color display to allow room for everything, including time-correlated views of mixed-signal systems and non-time-domain analysis. You will love the impressive display viewing angle; and the very small instrument footprint makes it easy to work anywhere. WaveRunner Xi has the best problem solving capability, whether you are gathering statistical data on thousands or millions of events, converting signal information into a statistical, modulation, or frequency domain for better understanding, or using WaveScan? to find anomalous events. 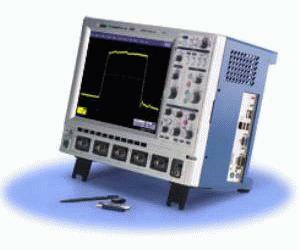 In addition, WaveRunner Xi oscilloscopes have numerous application packages to solve specific test and measurement challenges. Add high performance mixed-signal capability to any WaveRunner Xi with the MS-500 or MS-250. These solutions can capture digital signals with speeds up to 500 MHz. Available in 18 or 36 digital channel models and with long 50 Mpts/Ch memory the MS series are the ideal tools for efficient testing 16 bit embedded systems where all 16 ADDR and DATA lines can be viewed simultaneously. The LeCroy proprietary method of data transfer and processing permits wave shapes to be captured and processed 10?100x faster than those of other oscilloscopes. The result is better capability to perform advanced WaveShape Analysis, and faster debug.